This review is something I'm shocked I haven't done yet. This novel is by far one of my favourite novels of all time. It's an incredibly heartbreaking story that teaches you a lot about life and reasons to live your life to the fullest. I'm going to jump right into the post now because I cannot wait to discuss all the things about this novel that made me love it! Since this novel was a memoir of Paul's life, he's mostly the only character in this novel that I find important to mention. Paul was intelligent. He thought in a way that many people don't think and he considered the merits of all his decisions before and after making them. During the entirety of this novel you followed Paul whilst he made decisions that would alter not only his life, but also the lives of the people he surrounded himself with. Paul lived his life to the fullest and he didn't make choices lightly, especially after he learned of his diagnosis. Of course he wasn't strong all the time, but even in his moments of weakness, he never failed to show how much he was straining to live and enjoy life until he couldn't anymore. I also loved Paul's intelligence and determination to be the best student, husband, surgeon, and eventually, father, that he could be. This novel broke my heart into a million pieces the entire time I read it. Of course there were moments of humor and happiness, but at the same time, knowing the outcome, it was bittersweet. It's not a secret that Paul succumbed to his illness and passed away, but that's not what this novel is about. This novel is about living. It's about living you life, even after you're faced with decisions and obstacles that have the power to cripple you. It's about living whilst knowing you're going to die, and not letting that change the connections you make with those around you, or the impact you make in the lives of others. I have read this novel twice now, and I don't doubt I'll be reading it many more times throughout the span of my lifetime. It is a novel that has the ability to make you cherish the relationships you have and never take them for granted. The first half of this book really fed to the medical junkie aspect of me. 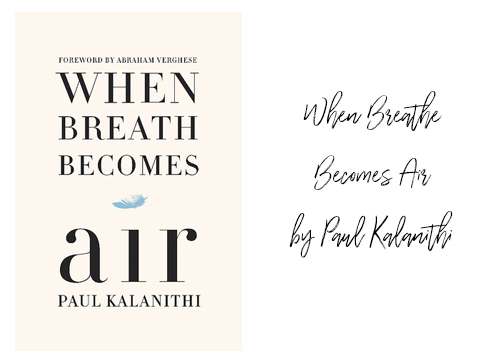 It followed Paul's journey to discovering what he wanted to actually do when he grew older, deciding between pursuing writing or surgery. Ultimately he chose surgery, but it's ironic how writing made it's way into his life when he most needed it to. We then get to spend time with Paul during the peak of his career as a surgical resident. Paul was a great surgeon. He was chief of the residents and along with the task of learning and taking charge of his surgeries, he also dealt with scheduling his fellow residents and all of the paperwork that came along with being chief. Paul was well on his way to becoming an incredible surgeon, and many would argue he already was great. Following his diagnosis, Paul contemplated giving up surgery. He wasn't sure he could do it, especially with his impending doom (too much?) hanging over his head. This novel is an important read. It's something that I would recommend everyone to pick up and take their time to read. Paul's writing is magnificent and it really shows the depth at which he went to get his message across to us. 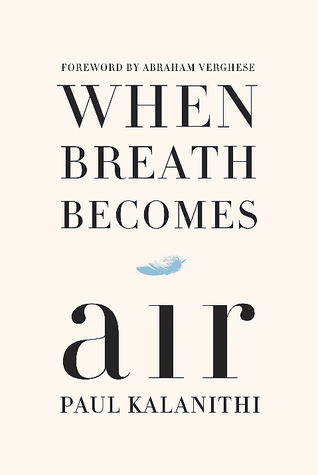 That concludes my long and slightly rambly review of When Breathe Becomes Air by Paul Kalanithi. When people ask me what my favourite book is, it's usually this one that I mention. It's amazing and I really do recommend it to everyone! Please comment down below if you have read this novel and what you thought about it! "Yet one thing cannot be robbed of her futurity: our daughter Cady. I hope I'll live long enough that she has some memory of me. Words have a longevity I do not. I had thought I could leave her a series of letters-but what would they say? I don't know what this girl will be like when she is fifteen; I don't even know if she'll take to the nickname we've given her. There is perhaps only one thing to say to this infant, who is all future, overlapping briefly with me, whose life, barring the improbable, is all but past. The message is simple. When you come to one of the many moments in life where you must give an account of yourself, provide a ledger of what you have been, and done, and meant to the world, do not, I pray, discount that you filled a dying man's days with a sated joy, a joy unknown to me in all my prior years, a joy that does not hunger for more and more but rests, satisfied. In this time, right now, that is an enormous thing."